Again I am reflecting to last summer, but little bit differently this time. Due to the stressful life situation (health issues, if you have not been reading my blog before or for a while), my knitting fell aside because to me, knitting is very relaxing and I usually drift off into my deep thoughts while my hands busily create stitches. While this is good at times, last summer it was not, since all I kept inside my head, were thoughts of worry and every time I picked up my knitting, it was really a short cut into worrying. When things got really bad, my hands were shaky, and while I knit, I can hold on to the needles with very little tension, thus leading to even more hand shaking. I soon realized that knitting was not helping me at all. Even in my darkest times, I rarely lose all the hope, or should I just say, I can still dream about better times. 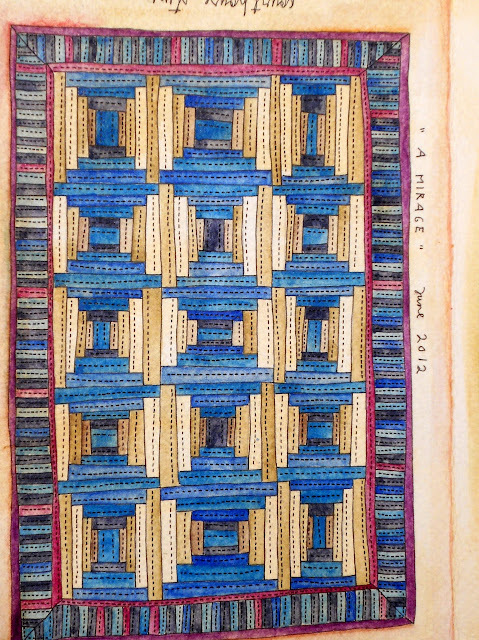 I surfed through internet at times and came across Melanie Testa's site and the title of her book "Dreaming from the journal page", kept coming back to me. What would I dream of if I were to keep a journal? Of course health issues improving, but also other smaller things as well. Since I had idle hands, I started to dream about things to make one day when there would be more time (and energy). I have never been successful in art journaling but definitely I could draw about what I would make when things would get better. While I dreamed of making new wool sweaters and socks, drawing them did not sound such a great idea. 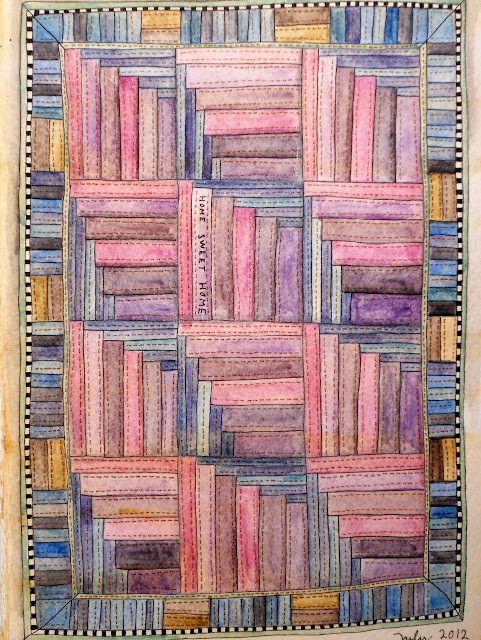 Instead I drew a small quilt, colored it mainly with water colors and used ink pen to add quilting to it. It did not require lot of equipment to stress over, it was easy to lay aside and come back to and it did provide me a lot to think about. I was working small, I really had to concentrate to stay inside the lines and was able to control the hand shaking a bit. It does sound strange, but it did work. I made a few, started to name them, but never really got into the journaling part. Journaling again would have made me to look inside my head and I did not feel like bringing all the worry to the surface. I knew it was there and I knew it had settled there for the time being and it would not go away; there just were not enough words in this universe to carry the worry away, so I better just put a lid on it. While heath issues improved, most of the worry evaporated, and now I have just the usual amount of worry that all the mothers of the world carry around, as we all worry over our children. Sometimes it is just whether or not they are eating healthy, or use the proper amount of woolies, or listen to music too loudly and ruin their hearing, or do they sleep enough, or use money wisely, ... oh, the list goes on but these are all good worries. 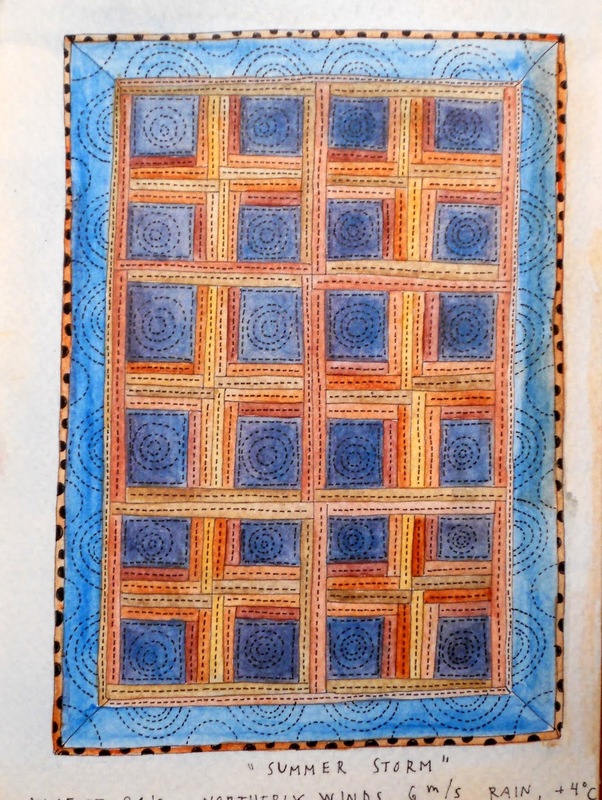 While I was drawing and coloring my small quilts, I learned a lot about water colors and color combinations. I thought about binding these small quilts into a book and to name the book "Cabin fever" since I fell in love drawing log cabin quilts but also because all my days were spent in the house, rarely did I go anywhere. So far, I have not made the book, but I might one day. Here are just a few here, there are some that I don't like that much and when and if I bind these into a book, I am letting only the ones I like into it. When the autumn came, life got better, I could get back into my life more and I realized that I could actually make a quilt out of cloth. In October I started to make real small quilts, but of them I will talk about next time. One more small thing that I learned this fall. I kept remembering the bad times, and I somehow thought that it was my duty (strange, isn't it, but I thought that if I kept thinking about the bad days, they would turn into golden memories or they would teach me an important lesson) to think about them, until one day, I suddenly realized that what was gone was gone, and there was no need to go back, those days were gone for good and I was just making myself sick with remembering them. And it did feel good when I learned this lesson. I was walking the dogs, and I literally left all the baggage by the roadside. Lene, Thank you for your fantastic blog. 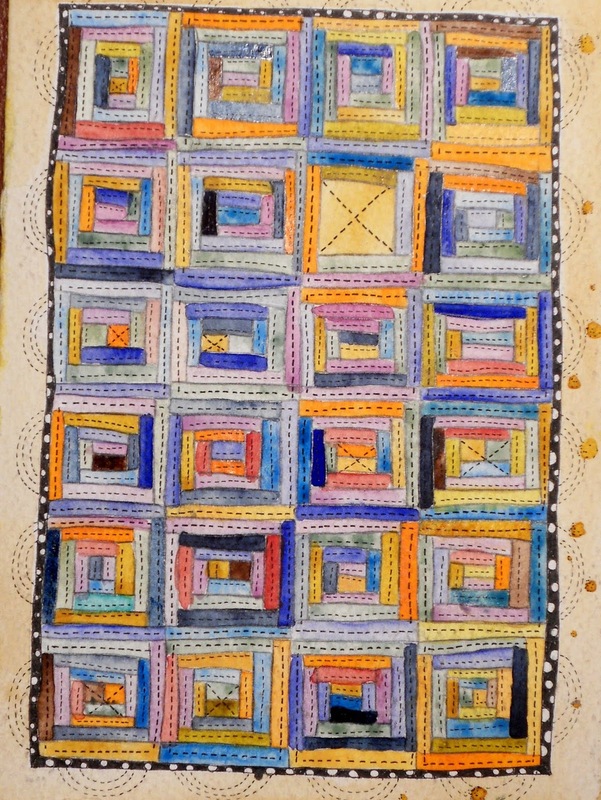 The small art quilts are lovely and I can hardly wait to see your post on the actual fabric quilts. I love your knitting projects and felting projects (small animals) too. As for worry, by itself it never solves anything. Better to look forward and move forward with hope, as it sounds like you are doing. Happy days and good health to you! I love your newest blog header drawing. Your creativity is amazing. I always feel so inspired after leaving your posts. I hope things are getting better. THanks for sharin your thoughts and positive attitiude. This is the most beautiful post Lene, I wish as a Mother I could put all my worry aside, it makes me ill all there is in my mind that I can not properly get out, I think your quilts make a perfect way to organize your brain and push the worry aside. I am so glad you are doing better. I agree with Bonnie; you are the most creative person I "know"! I come here to marvel, and today's quilts made me do just that. Yes, leave the bad times behind! What a simple realization, but not so easy to get to. It is great that you listen to yourself and find a channel for your creative voice. The colors and shapes of your paper quilts are lovely. Best wishes for a peaceful solstice, a merry Christmas, and a New Year full of health & happiness for you & your family. Such beauty! As a knitter and a quilter, I can appreciate how you "put the blocks together," even if it is just ink and watercolor. I especially like the calm before the storm. 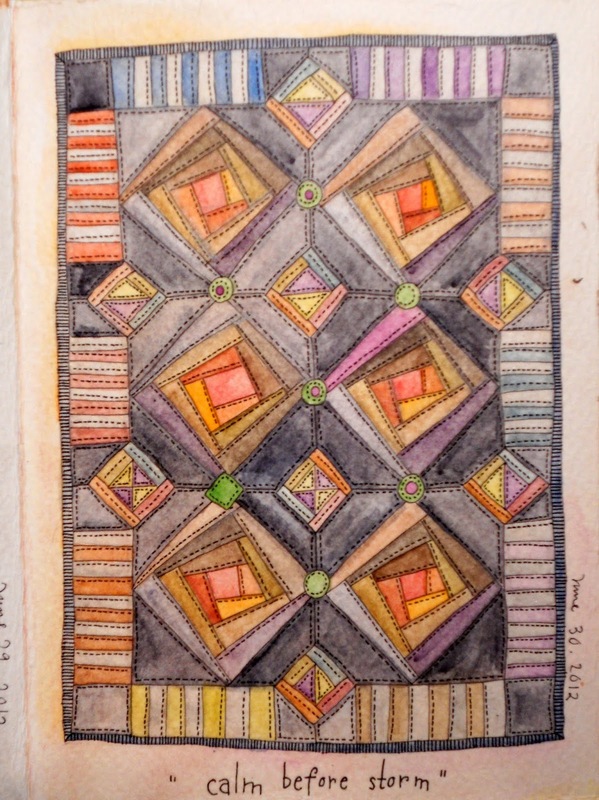 I am curious -- you have such stitch definition in the drawings: do you see if these were made that you would hand quilt them with quilting thread, machine stitch them, or even use a thicker cotton for greater definition? Bravo that you have let go of some of the load you carry. May your Christmas season continue to show you peace. I am so glad you were able to leave your worries behind, and that things are looking better for you. I am a mother, too, but I was a worrier long before I had children, and it is very hard to let some worries go for me. Your quilt designs are absolutely beautiful and hope you try some in fabric. As always, I am inspired by your creativity! Your quilts are hauntingly beautiful. I've never had the desire to make a quilt, but as I look at your exquisite paintings, it's all I can think about. Your little quilt works of art are beautiful! I love the idea of putting them into a book. And, reading the story of what you were experiencing and thinking as you created them makes them even more rich and interesting. Glad you're feeling better. Beautiful, bright quilts. It's amazing what good things sometimes come from dark times. Thank you for lightening my day. Thank you. I lost my younger son in October, and. I recognize the emotions in your quilts. I am hoping to get to the peace in your last quilt soon. Sometimes the baggage is too much to leave by the side of the road, but perhaps some day... You are an inspiration. lovely post as usual, Lene. I love coming back here. Such a lovely and insightful post! And the pages are evocative. Your work is always so distinctive, Lene! Lately I have been in a period of immobilization, in terms of creating. A blank paper stares at me and I stare back, then sigh and turn away. I hope this will pass soon. Thank you for sharing Lene, especially the bad times. There is a lesson there and it requires courage...I hope to find mine as you did yours! 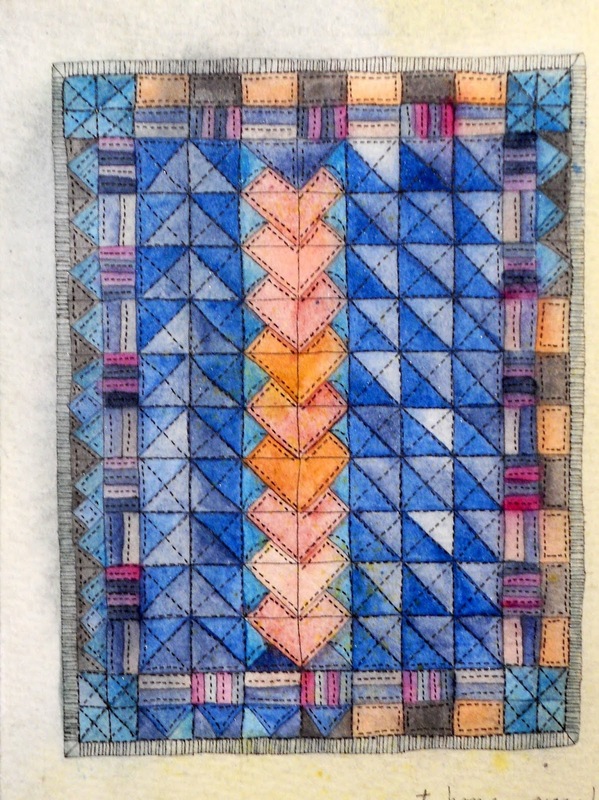 I love your quilt drawings. The stitch marks..... Perfect. What a great way to play with color, design, and texture. Thank you...just, thank you. For the beautiful post and drawings. I love the festive header today! I am so glad for you, Lene. Thank you for the words, and the paintings and the heart-therapy. Lene, these are astoundingly beautiful. I've been reading your blog for over a year and never commented before, but I just couldn't look at this post and wander away without telling you how much it touched me. Lene, I always feel so much stronger after I read your blog. I hope its not too rude to say this but it is so good to see you continuing on, even when things seem downright impossible. It gives me a person to look at, almost an inspiration. This makes your art so much more meaningful to me, and reminds me of some reasons why I too craft. I really do love your works, especially these drawings, and knowing the emotions behind them make them so much more powerful. If you have the energy to do so, please do make this book. I would truly love to have some of your art in my daily life, and the book would be a great way to share with many people. These are so lovely. They make me want to get out a journal and start drawing and painting. I wish they were available as note cards. It would be wonderful to send someone such a beautiful note in the mail. Such a beautiful, thoughtful, heartfelt post. 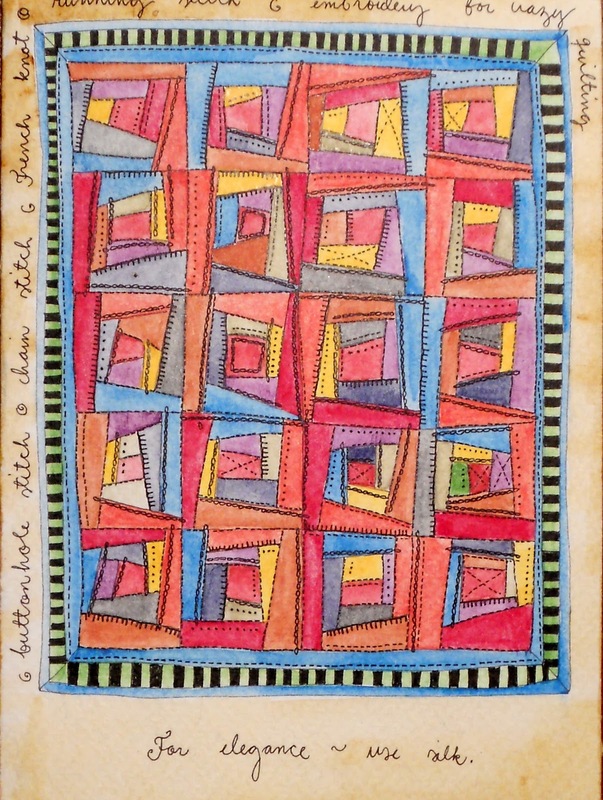 Your quilt drawings would make lovely notecards. 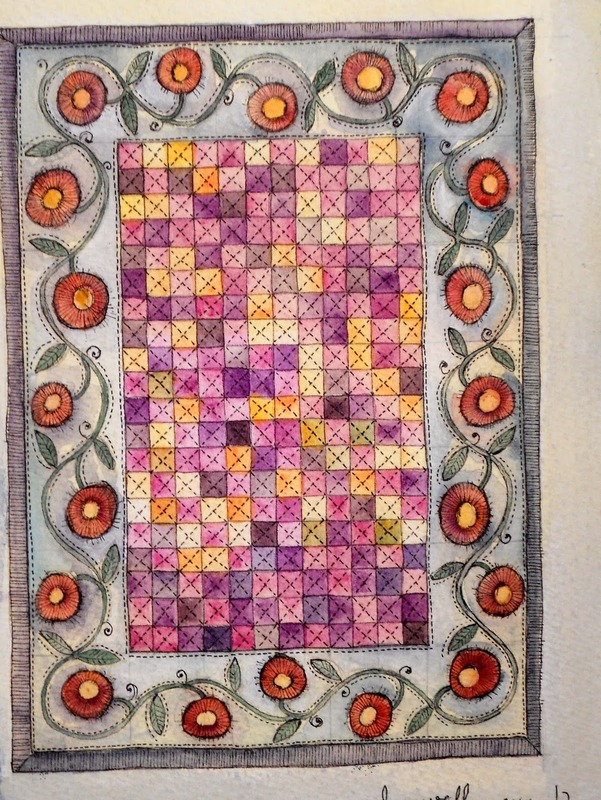 Lovely quilts -- I can almost feel the softness and warmth in them. They look like actual quilts!!! It's good that despite what you're going through, you can create such lovely work. Thanks for sharing your thoughts and your art. Hoping for brighter days for you!!! i'm always waiting for your posts:) what a pretty dwawings, quilting ideas! I must thank you for this lovely, thoughtful, inspirational post. I love your new header, your words, and your amazingly wonderful, colorful quilts. As I scrolled down, it seemed like each new quilt revealed was my favorite. I love them all and will return to this post many times when I need some help to let go of my worries. I hope your Christmas season is filled with much love and the peace of letting go. these.are.gorgeous. you should have prints made and sell them. Lene, I am sorry you've been suffering with worry, but so glad that out of that worry came relief, beautiful art, some new creative interests, and most of all a revelation that takes away some of the stress. Best wishes for continued improvement in health issues and everything else, and thank you for sharing your beautiful art! Sweet wee quilts. I would love to see them made up and stitched by hand. I am so glad that you have resolved some of the worries in your head. Motherhood is certainly not easy. Thank you for sharing your journey with us. Although we have never met, I feel privileged to know you on-line. I look forward to the art and personal warmth of your posts. Merry Christmas and Happy New Year to you and your family. How beautiful you're quilts are and I am so glad you are feeling better now and putting the worries behind you. Merry Christmas and a Happy and Wonderful New Year. Beautiful quilt pictures and I'm glad they helped you find a way to move forward. I'm looking forward to seeing the fabric versions. Are you writing a book? Illustrating a book? Oh! I hope you are making a book! A beautiful book full of your beautiful drawings! Will you sell it in the USA? I hope so. Your tiny quilts are truly beautiful. I am so looking forward to seeing the fabric ones. How lovely are your paintings!-And how poetically expressed "to put a lid on my worries"...I can only tell you that I understand you. Gorgeous, soulful quilts. Thank you for putting all this into words and sharing it. 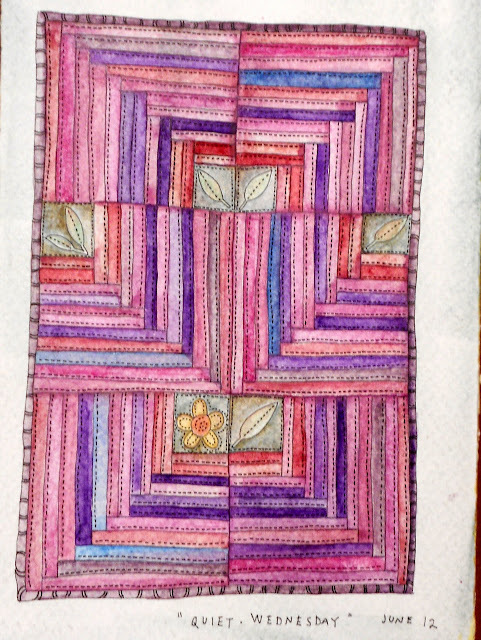 The journey/process of first trying to use art journaling as a means to help you get through difficult times, and failing at it, and then finding this, designing quilts, as the way to enjoy the creative process and calm oneself even when it is impossible to carry out the usual forms of handicraft. I wish the best in life for you and your loved ones. I am fairly new to blogging. How can I follow your posts? 4831Thank you, once again, for sharing your thoughts and ideas. I am always inspired by your creative channelling, and your results are always uniquely you. Lovely post, Lene, and the drawings are beautiful. You take such care, that even your preparation is a joy to look on. Just want to let you know that I have been reading your blog for years and it's one of the few places on the internet where I always come back to see how you are doing. My father always said "Nothing is so bad that it is not good for something". 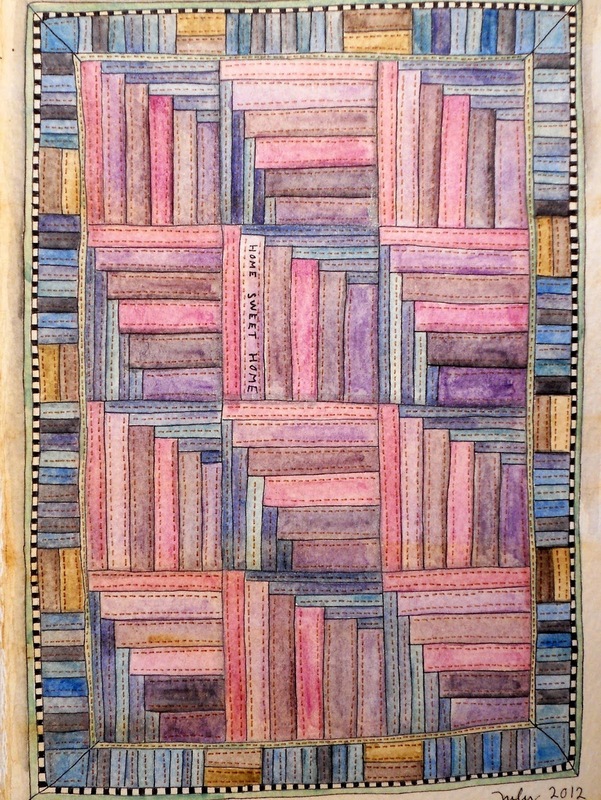 Love looking at your watercolor 'quilts'. You are inspiring me to try some drawing/painting. Your little "quilts" are just lovely. Any one of them would be beautiful stitched up in fabric, or just hung on the wall as is. Thank you for sharing them. Every time I look at your quilt drawings, I find them lovelier than the previous time! Nicely done. Merry Christmas Lene to you and to your family. Lene, you are such a beautiful soul, and your little quilts are just lovely. Thank you for sharing your life with us, and for continuing to inspire us with your strength and creativity.